The first words of my first book today are “Elaine de Kooning.” What a curveball. With some 40,000 books out there about John F. Kennedy, plus a new bunch tied to the 50th anniversary of his assassination, how out of the blue to start with a painter. An abstract expressionist, at that. After painting him poolside, with Caroline sweetly sketching alongside, she went back to her studio. Working from memory, de Kooning tried to capture Kennedy from every angle and pose, and soon oils and charcoals of him covered her entire studio. He became her obsession. We all know about JFK’s many affairs and resignedly, I thought, here we go again. But no. “JFK’s Last Hundred Days: The Transformation of a Man and the Emergence of a Great President” (Penguin, 2013) is blessedly more subtle than that. Author Thurston Clarke doesn’t neglect the womanizing. (Elaine de Kooning is not a conquest.) But it’s just one puzzle of many. Why was such a publicly cautious man so incautious privately? Why do polls show he was the most popular president of our subsequent nine, when he made some of the biggest mistakes? Why do we still care so much? To that end, he walks the fence of JFK’s last few months and makes the case that he was changing in private: Apparently, he stopped the womanizing after the death of his premature son, Patrick, in August 1963 and grew closer to the first lady in shared tragedy. He also says JFK believed he’d win a second term more easily than his first, since a too-far-right Barry Goldwater would likely be the GOP nominee; he planned to axe LBJ from the ticket and J. Edgar Hoover from the FBI. Moreover, Kennedy now realized he shouldn’t have listened to his bellicose advisers on the Bay of Pigs disaster and during the Cuban Missile Crisis. Robert Dallek’s “Camelot’s Court: Inside the Kennedy White House” (Harper, 2013) threads the same needle as David Halberstam’s “The Best and the Brightest” 40 years ago. The lesson is threefold: Hiring great talent doesn’t guarantee getting great counsel; know when to ignore advisers; and, no matter what, it’s lonely at the top. The big one, however, is the “peace speech” at American University on June 10, 1963, a work of “magnificent culmination” writes Jeffrey D. Sachs in “To Move the World: JFK’s Quest for Peace” (Random House, 2013). The tone is striking: There is JFK, breaking from accusatory Cold War rhetoric to a deeper place, a war hero who hates war. We must stop demonizing the USSR, he admonishes. And peace is not a static thing but “a process — a way of solving problems.’’ The punchline: JFK suggests a nuclear test ban treaty. Sachs argues this was a big breakthrough. The speech was lionized in the USSR, and in a rare move the full text was reprinted both in Pravda and Izvestiya. Moments like that make the wound seem fresh, somehow. The pain gets even more unbearable in “If Kennedy Lived: The First and Second Terms of President John F. Kennedy: An Alternative History” (Putnam, 2013). Author Jeff Greenfield tries to keep “plausibility as my pole star” as his charged saga pours forth. The rain keeps up in Dallas that day, and the plexiglass bubble is put atop the convertible, thus deflecting Oswald’s bullets to hit but not kill. JFK makes an official visit to the Soviet Union after his reelection. And, most aching of all, our peacemaking president shortens the Vietnam War. This 50th anniversary, of course, has brought forth yet more new books about Oswald. “Dallas, 1963” (Twelve, 2013) fascinated me most, because it showcases an extremism all too relevant to our time. Authors Bill Minutaglio and Steven L. Davis give us a city that voted against JFK 2 to 1, a place the president called “nut country,” where the far-right “National Indignation Convention” had just been held, and visitors like Adlai Stevenson, LBJ, and Ladybird had been encircled and attacked by mobs weeks before the Kennedys landed at Love Field. Partly because of how our 35th president died, “Americans are not inclined to focus on his shortcomings,” writes Larry J. Sabato in “The Kennedy Half Century: The Presidency, Assassination, and Lasting Legacy of John F. Kennedy” (Bloomsbury, 2013). Much of the book focuses on polls taken today about how Americans assess Kennedy. His continued popularity is astonishing and maybe misbegotten too — Kennedy himself denigrated his first term. His record on civil rights is flimsy compared to LBJ’s. He utterly bungled the Bay of Pigs. So is it the martyrdom, then? Not solely: James Garfield and William McKinley were killed in office too, but there aren’t slews of books on them. 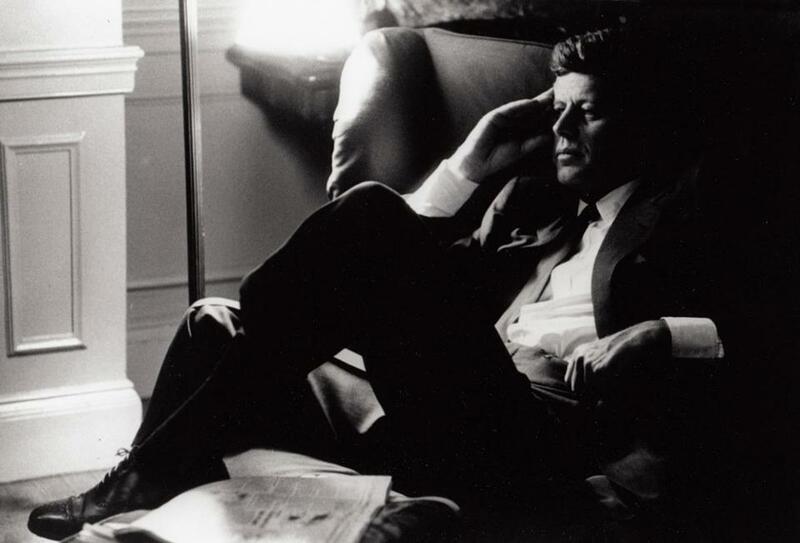 JFK’s looks, youth, charm, and charisma — all amplified as our first real “television president” — count for much. Add in his “ask not” call for service, and Kennedy becomes “the personification of the nation’s best qualities,” says Sabato. But that’s not the whole of it. Kennedy’s most profound legacy, surely, was his supremely wise leadership during the Cuban Missile Crisis. As speechwriter Theodore Sorensen says, “Every generation needs to know that without JFK the world might no longer exist.’’ Half a century after we lost Kennedy, it seems that no matter how you paint him, there’s more to see.